As you know I have been dying to paint my smallest’s bedroom since it had the most horrible wallpaper ever (on all 4 walls! 😱). Check out the entire room tour of how it was BEFORE and exactly how I removed that hideous wallpaper. I have also been a little obsessed with accent walls (it’s like they’re making a come-back!). You can see my last breakfast nook accent wall and my current craft room accent wall. 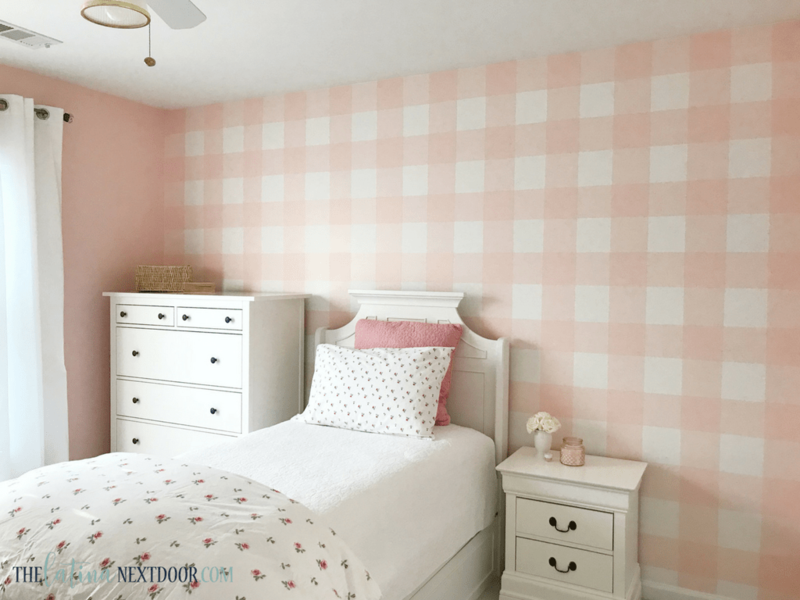 I even used removable wall decals in her nursery for an accent wall in our last house. 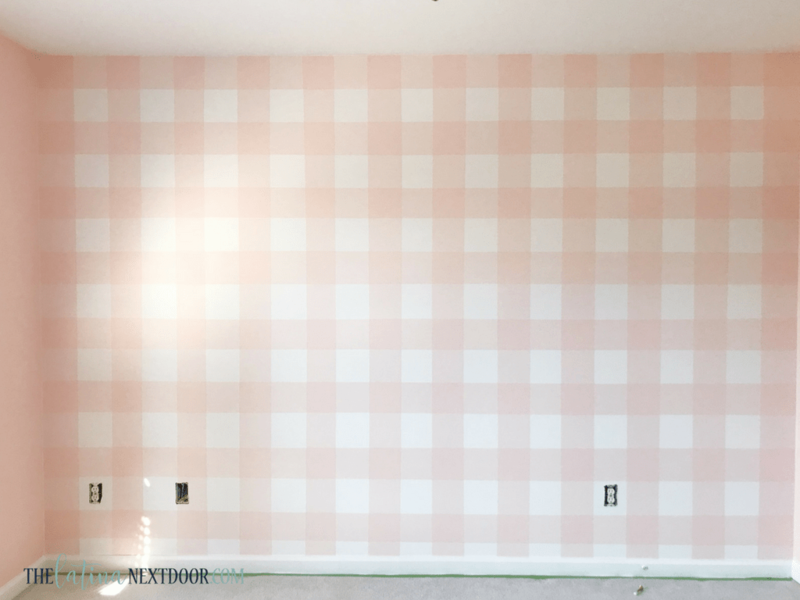 Comical Coral SW 6876 (for solid walls and for dark intersections on the Buffalo Check pattern. I took all of that down (I never want to do that again, EVER!) and painted 3 walls in Sherwin Williams Comical Coral and left the back accent wall SW Pure White. And here is where I ended up. 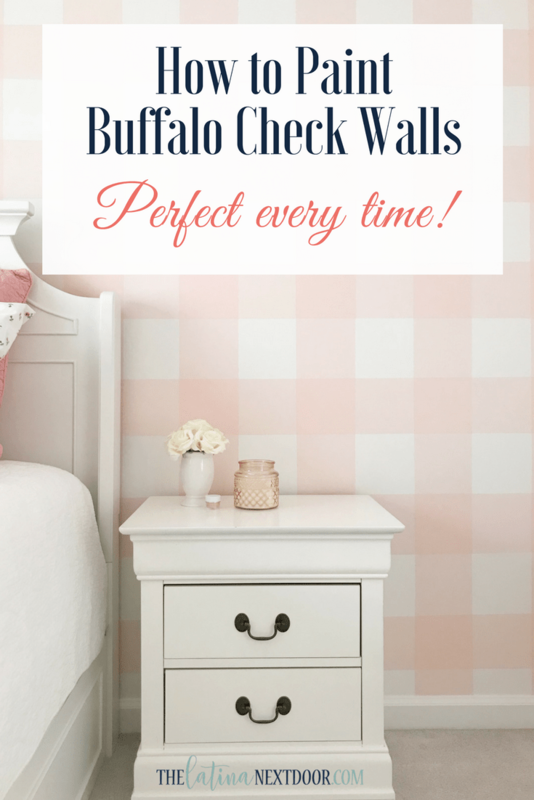 So to get started on Buffalo Check wall here is what I did so that you can do it too! 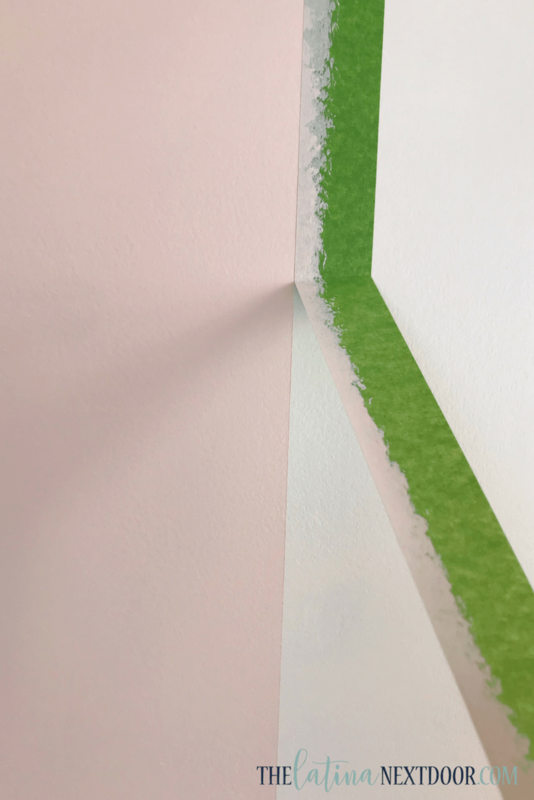 Tape off the top and bottom of your wall with Frog Tape. I’m pretty OCD so I chose to have 2 solid vertical lines on each end of my accent wall so that is was exactly the same on either end. For this I needed to have an odd number of columns on my wall. I knew I wanted my columns to be 6 inches wide. My wall was a total of 139 inches wide, so I divided them by 6 inches and got 23.167 – this was perfectly fine though. You will most likely not get an even division so just add the“extra” measurement to your end columns in equal amounts. Since it’s minimal it won’t be noticeable. 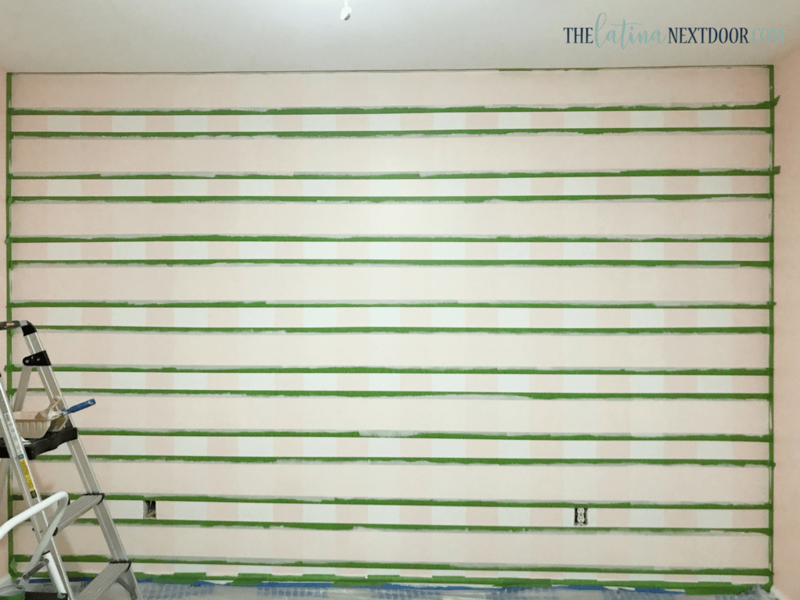 TIP: By choosing to do the darker lines on both ends of the wall, they will blend in better with the side walls and any extra measurement that I had to add to each end column was less noticeable. Now here is how I got the columns to go on evenly on the wall. First, find the center of the wall. Then measure out from that point on either side for the first column. 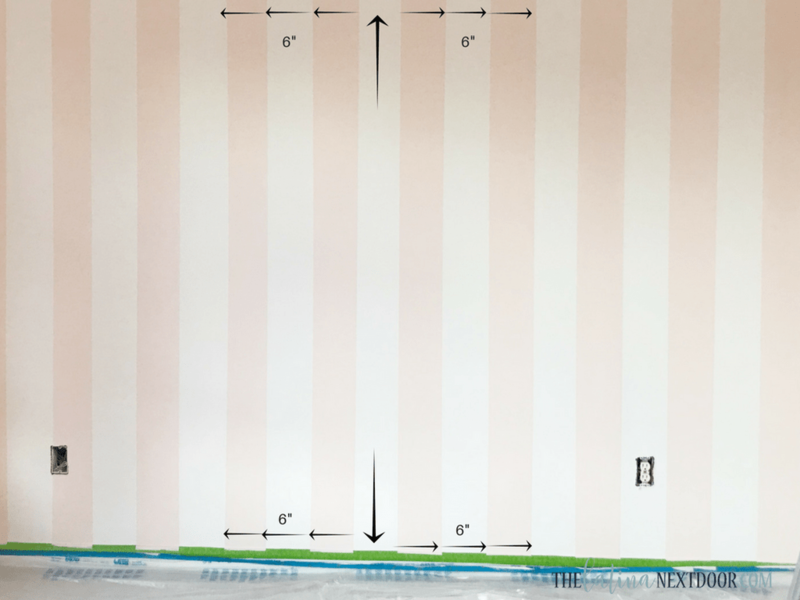 I wanted a 6-inch column so I measured 3 inches on either side of the center and marked it on the painter’s tape that I had taped to the baseboard. Then I added 6 inches for each new column until I reached both ends of the wall. 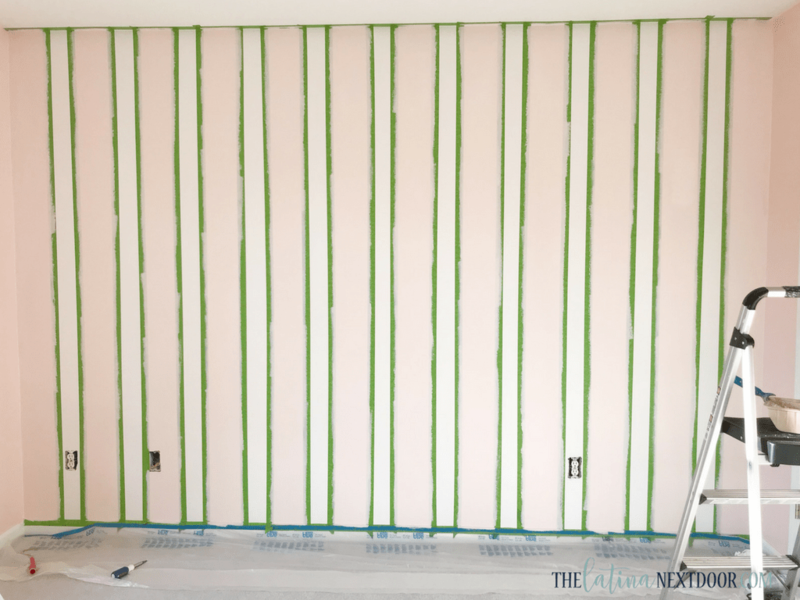 After you mark all of the columns on the painter’s tape on the baseboard, do the same to the top of the wall with the tape placed on the ceiling. 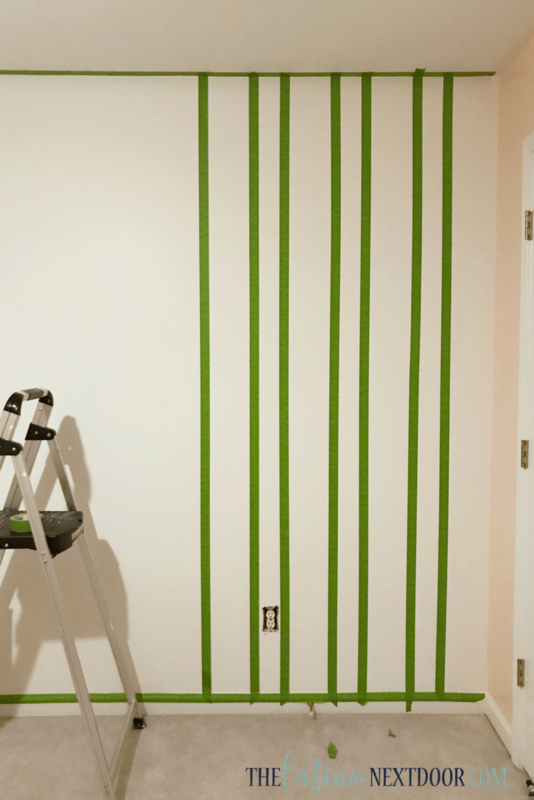 Add your tape vertically by matching the ends of the tape with the markings on the painter’s tape on both the top and bottom of the wall. 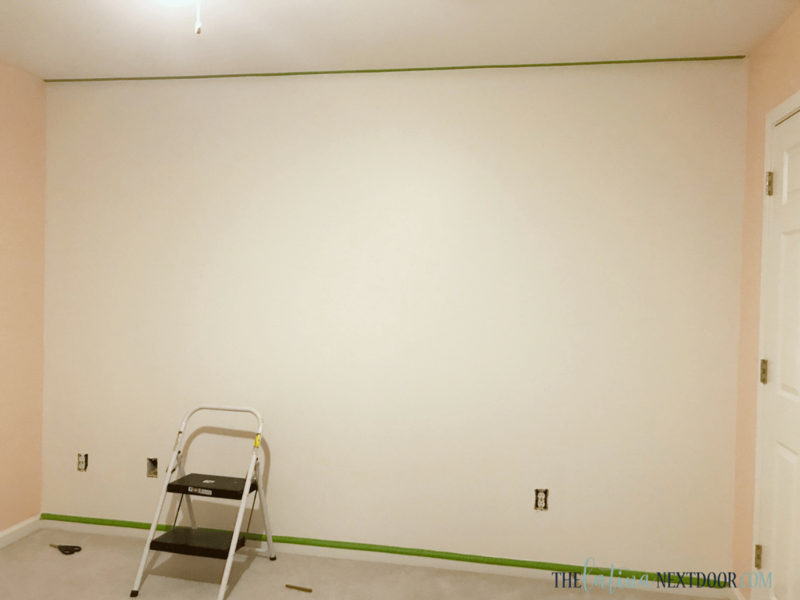 Once your wall is taped, paint with the lighter color. I used Comical Coral SW 6876 lightened at 50%. Apply 2 coats. Remove the tape while the paint is still wet and let dry AT LEAST 4 hours (I actually let mine dry overnight). 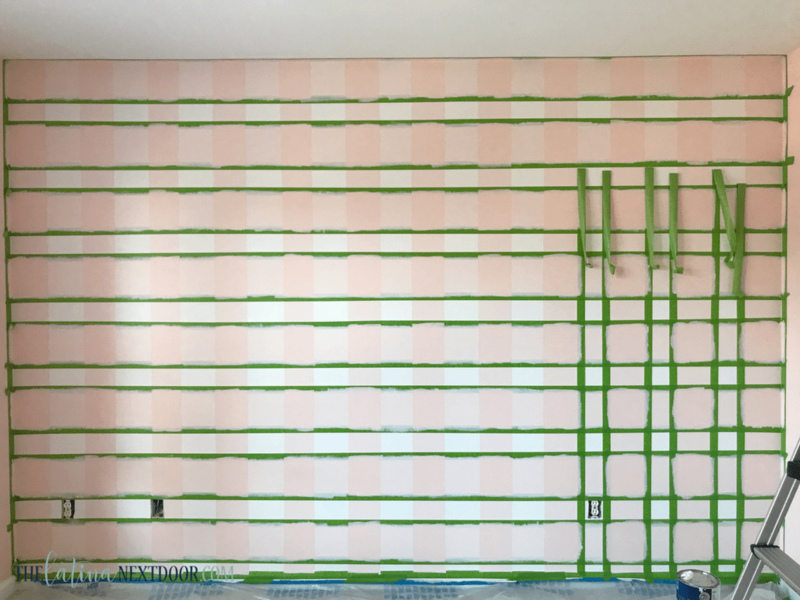 The Frog Tape will give you the cleanest lines. Since the wall will not be the same length as the width, I wanted to make sure that the top of the wall had a complete row and worked my way down (since the bottom part of the wall gets covered with furniture most of the time and won’t be as noticeable). 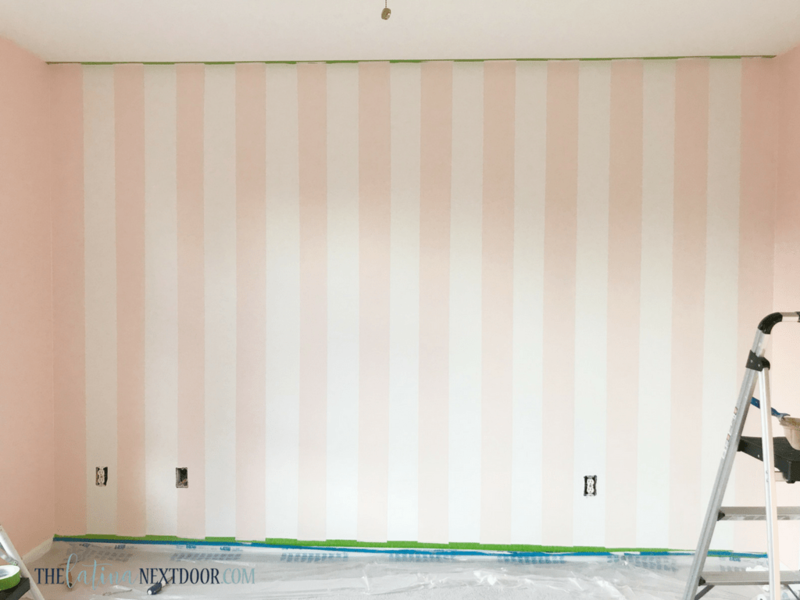 Now add painters tape to the side walls where they meet your accent wall. Since the columns were 6 inches wide I measured 6 inches from the top and worked my way down on either side to get 6 inch horizontal lines –marking on the painters tape on either side as I went down. 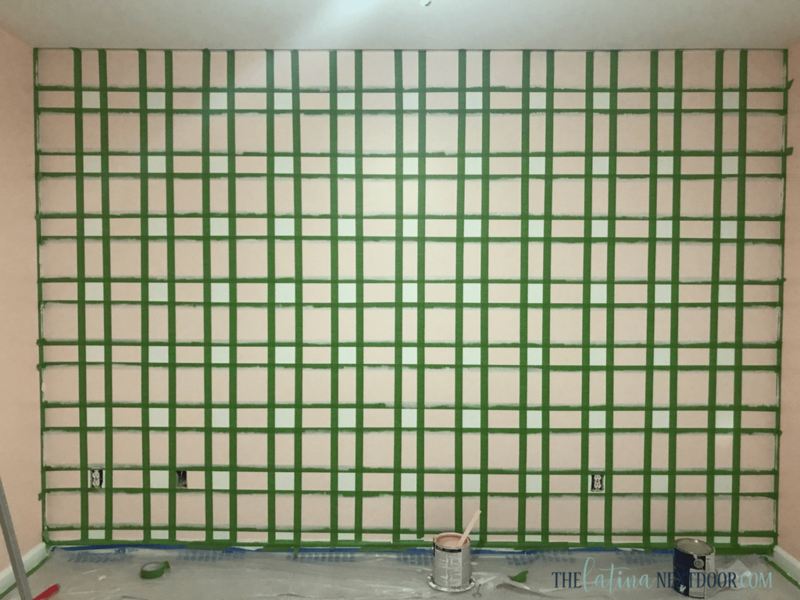 Add your tape across the wall from end to end. This will take two people to do. 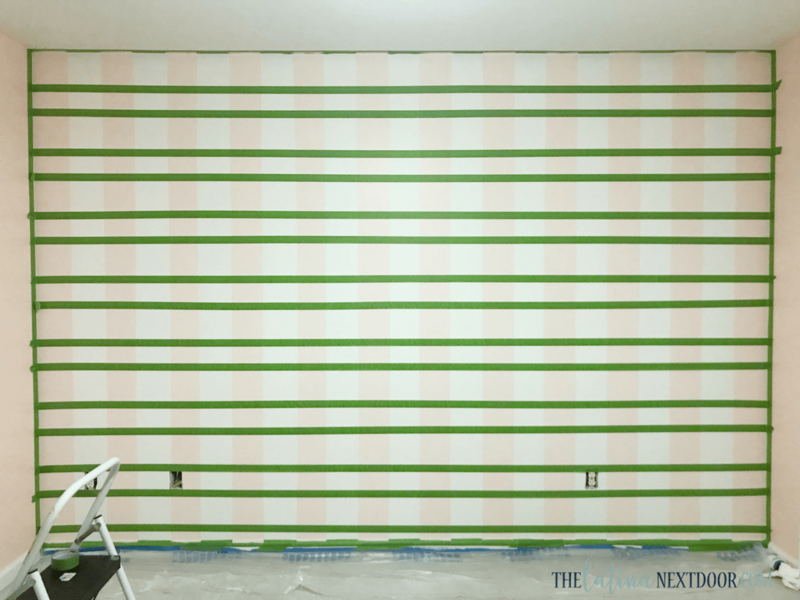 Then paint the horizontal rows with the SAME color. Use 2 coats. Let dry completely this time. DO NOT remove the painter’s tape. Add vertical tape again in the same place you had before for your original columns. You want to paint the “intersections” with the darker color. Apply 2 coats. The color will look really similar, but it will start to darken once it starts drying (don’t freak out just yet!) . 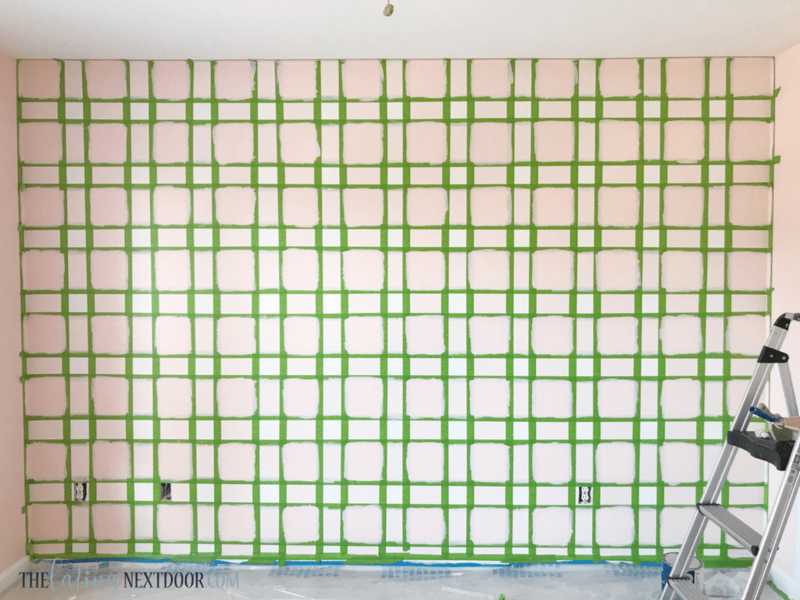 Then start removing the tape immediately after you’re done painting. You don’t have to wait till it’s completely dry. After removing all of the tape, let it dry completely. Touch up any areas (honestly I think I had just one tiny spot because the tape is just that good). FYI…You will end up using almost 3 full rolls of that tape. I totally loved how it turned out! It was perfect! I added her furniture in the room. I am still trying to figure out the placement but I am so happy at how it’s turning out so far. Let me know what you think!?!? Are you going to try it yourself now? I seriously want to do this somewhere else now. Psssst.. Don”t forget to subscribe below to get more fun tutorials like this. Also, have you checked out my YouTube channel yet? Head on over and check out my latest videos here! Yep, that is definetly perfect! I wish I still had small kids so I could find a place to do this. I LOVE IT and in pink too! Great tutorial as well. Pinned! This is just beautiful. Its one of those projects you can’t rush but so worth the final r! this looks SO good! 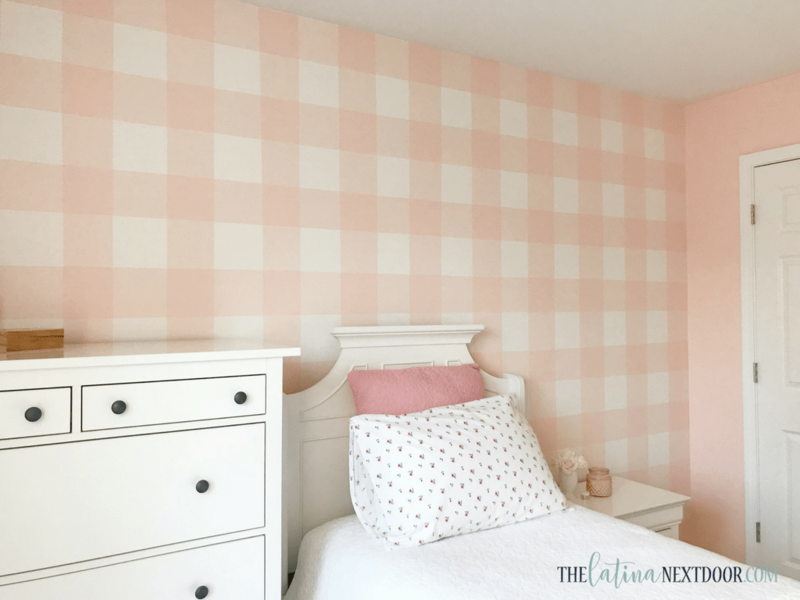 I am debating whether to do buffalo check wallpaper in my kitchen or try your method. I’m just not sure I have the patience to make sure all that tape is level. But your daughter’s room looks so gorgeous. Great job! Thank you! 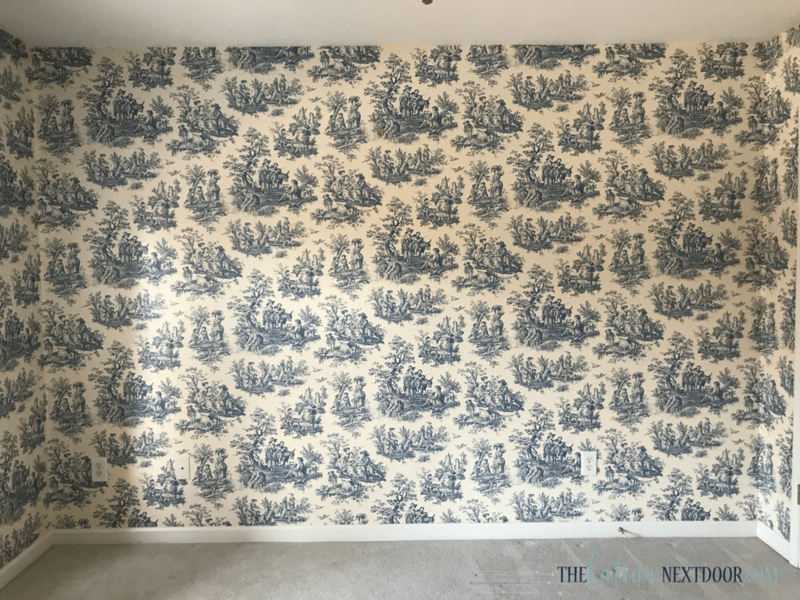 My hesitation with wallpaper is the fact that I have had to remove it (oh, it’s not fun!) and I cook pretty regularly so I am not sure how it would hold up against all the elements of a kitchen. I wish you the best on whichever you decide though! 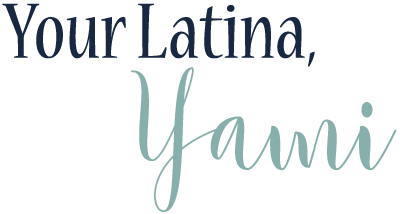 Yami—I love your wall! 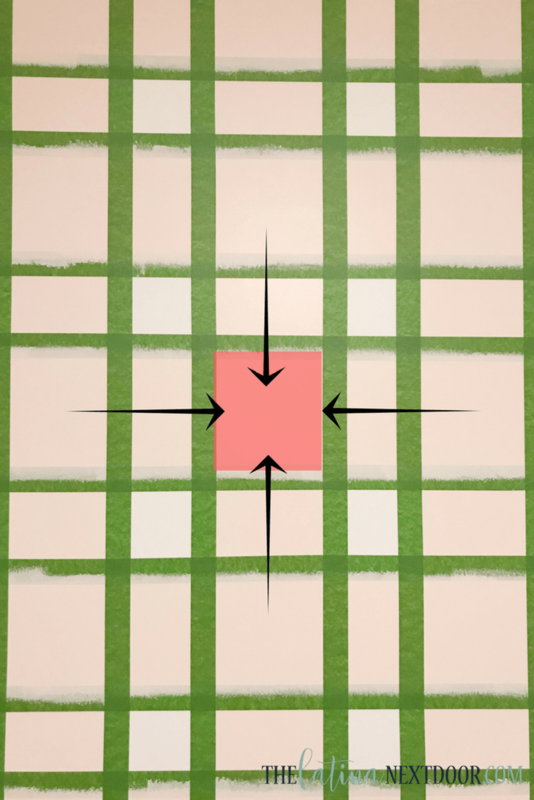 Could you please be more specific about exactly which “intersection” squares you painted with that last darkest coat of paint? Thanks so much.